How to facilitate Innovation in SMEs? The AISAB Project will address the need within the EU to improve the level of innovation and its impact, particularly in SMEs. Building on the work of other innovation projects and materials, it will develop approaches to develop the skills that support SME innovation from an HEI context and through VET. These complementary streams of work will see implementation of initiatives to drive innovation, both during the project and also on a sustainable basis, by embedding the outcomes in the day-to-day activities of HEIs and organisations delivering VET to SMEs. The University of Gloucestershire (UOG) is a diverse, vibrant community of 9,000 undergraduate students, 1,000 postgraduate students, 40,000 alumni and 1,000 staff from all across the world. With campuses in Cheltenham and Gloucester, the University offers its students a specialised and dynamic place to learn, grow and make lasting connections. Hafelekar (HAF) was founded in 2001. HAF combines expertise in managerial, socialand educational sciences. Customers are entrepreneurs, business companies, non-profit organisations as well as clients in the public sector. The focusses are on personal and organisation development, innovation management, regional development, qualitative and quantitative social research, and project management. Prompt Ltd. (PRMT) was established in 1989, by highly qualified IT experts with intensive R&D activities based on their academic background. The company has two main divisions, one of them is the delivery of IT training, e-learning and Content Management Systems (CMS) solutions, the other is software-hardware development, security systems and IT system integration. Related to its professional work, PRMT has a wide partnership at both national and international level, collaborating with several research and educational institutes in R&D projects. The University of Sopron (SOP), as a successor of University of West Hungary, is known as one of the top higher educational institutions in Hungary. SOP offers a broad range of training and degree programmes, from undergraduate programmes (BA, BSc) to master programmes (MA, MSc) and doctoral (PhD, DLA) programmes, in the fields of natural, technical, agricultural and social sciences (including economics), arts, applied arts and education. The University of Primorska (UP) was established in 2003 as a third national university in Slovenia. The activities of UP focus on offering quality study programmes at the three levels (Bachelors, Masters and PhD level), consists of the following faculties: Faculty of Humanities, Faculty of Management, Faculty of Mathematics, Natural Sciences and IT, Faculty of Education, Faculty of Tourism Studies – TURISTICA and Faculty of Health Sciences); as well as the research institute (Institute Andrej Marušič), a University Library, and Students’ Residence. The Institute for Innovation and Technology within Korona (KOR), is an innovation oriented organisation from Slovenia with its mission closely linked to raising innovativeness in schools and in the business sector. The organisation operates in close cooperation with a wide network of specialists of various professional profiles, and collaborates with national and foreign organisations following the open innovation concept. Fondazione ITS (ITS) is a short-cycle higher Education Institution founded in 2010 and located in Bergamo, in Lombardy Region. ITS has introduced a unique Higher Education Institution (HEI) model in Italy, which applies a strong innovation-oriented on–the-job training approach (dual system), in a real work environment and/or in high-tech laboratories (an approach that is similar to the Fachhochschulen in Germany and SUP in Switzerland). All courses delivered by ITS are post-diploma training paths, oriented towards innovation-oriented sectors. The University of Granada (GRAN) is a classical university (founded in 1531) and one of Spain’s leading universities. GRAN is a public higher education institution and is committed not only to quality and excellence in education, learning and research but also to activities targeting the transfer of scientific, technical and artistic knowledge to society; the betterment of society; and a sustainable environment. The actual meeting for the AISAB Erasmus+ KA2 project was held in Sopron, Hungary. The partners from Austria, Italy, Slovenia, Germany, Spain, UK and Hungary arrived on time at the University of Sopron, where the Alexandre Lamfalussy Faculty of Economics hosted the meeting. 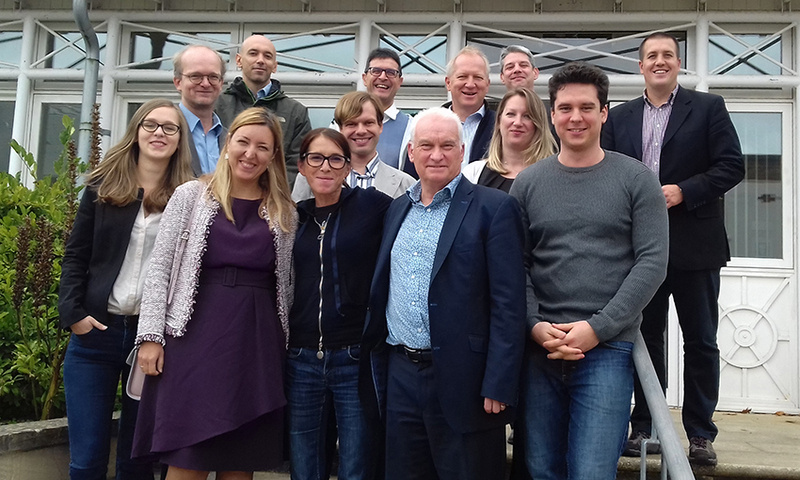 The Applied Innovation for Students in Business (AISAB) project supports SMEs in generating innovation through student led consultancy projects across Europe. In spring 2018 three projects were carried out by University of Primorska (Faculty of Management) postgraduate students. This is the story of one of those projects. Faculty of Management of the University of Primorska is partner in the international project AISAB in the field of innovation and development. Nine students of postgraduate study programme Management of sustainable development are participating in the project: Mateja Bucaj, Selma Fijuljanin, Petra Hozjan, Korana Kovačević, Klemen Leonard, Anja Nograšek, Valentina Pecchiari, Daria Safronova and Tina Žitko.Project coordinators and mentors are prof. Borut Likar and assist. prof. Peter Štrukelj. Tubby Tom’s: Sizing Up Hot Sauces - An Applied Innovation for Students in Business Case Study The Applied Innovation for Students in Business (AISAB) project supports SMEs in generating innovation through student led consultancy projects across Europe. In spring 2018 five projects were carried out by University of Gloucestershire MBA students. The projects have had immediate impact and are projected to create over £500,000 in value for their clients over the next 5 years. This is the story of one of those projects. The description of Aisab project is published on the Erasmus+ Project Results Platform. The visitors can find Aisab by searching for the keywords of: - Enterprise, industry and SMEs (incl. entrepreneurship), - New innovative curricula/educational methods/development of training courses, - Entrepreneurial learning - entrepreneurship education- The database gives access to descriptions, results and contact information of all projects funded under the Erasmus+ programme. The visitors can find inspiration from the pool of good practices and success stories, i.e. projects that distinguished themselves in terms of policy relevance, communication potential, impact or design. Aisab infos are available at the link: https://bit.ly/2IqFyTw. The second meeting of the AISAB project was set in the city of Granada (Spain), the 1st and 2nd of March, 2018. First of all, it is interesting to highlight that Granada is a wonderful historical and monumental city, which is situated in the South East of Spain in the province of Andalucía. Regardless of being set in the South of Spain it has the most Southern skiing slopes in Europe, since it has a high Mountain named Sierra Nevada. Likewise, it is near the Mediterranean Sea, since only 76 km separate the city from the coast and the beach.